Brought to you by The Nutcracker, Champaign Urbana Ballet‘s time-honored family tradition coming this December for two weekends. Click here for more information, including show times and ticket info on The Nutcracker, at Urbana’s Krannert Center for the Performing Arts Nov.30-Dec. 2 and Dec. 7-9. Make holiday memories with your family! If you are on Pinterest, you’ve seen those “Holiday Bucket List” pins. They are a list of fun activities to see, do, or complete with your kids during the holiday season. You could think of them as a laundry list of more things you need to fit in during the holiday season, or like us, you can pick and choose from the events listed to add more local fun to your celebrations and, ideally, less stress. Because it’s hard to run through your mental checklist of things you have yet to get done for the holidays while making a snow angel on the quad, or while taking your favorite and your best to the indoor snow globe. 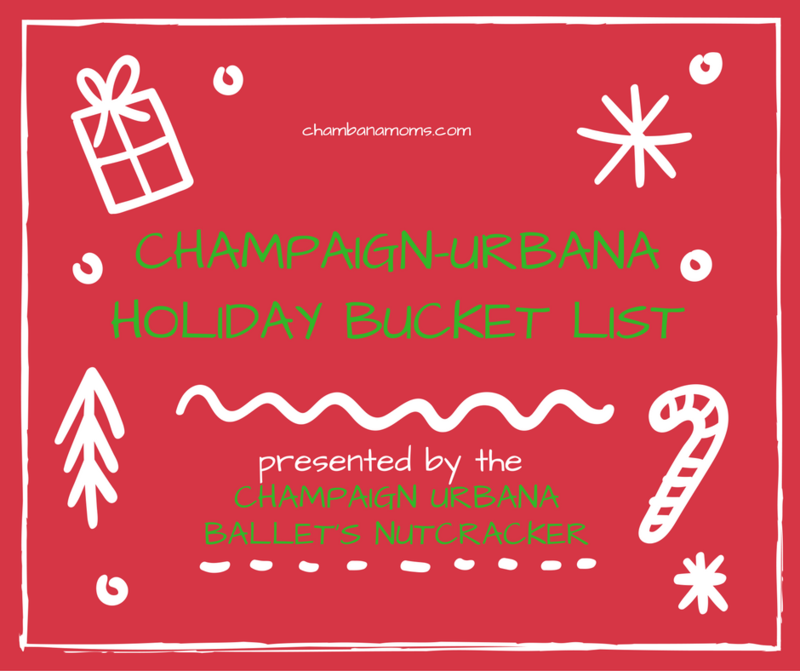 We’ve made up Champaign-Urbana bucket lists before, so we thought it was time we make up our own Holiday Bucket List, Champaign-Urbana Style! 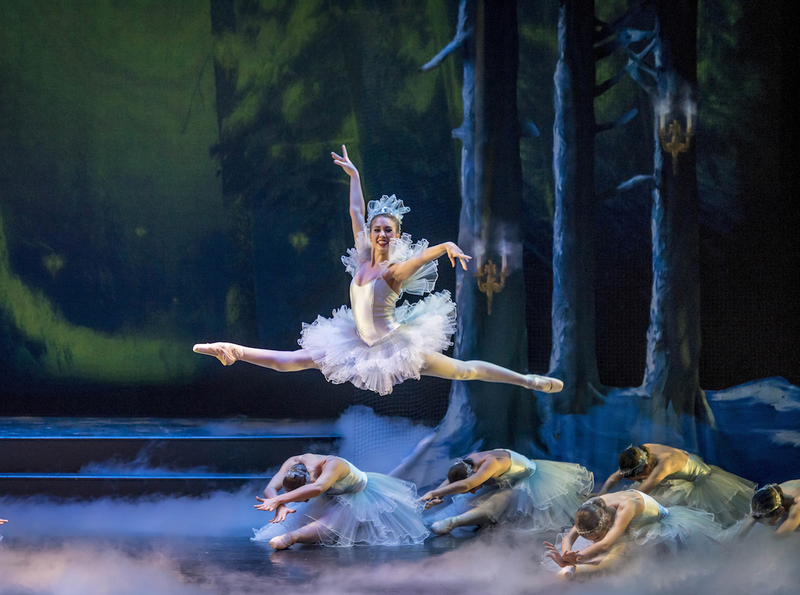 1) See The Nutcracker at Krannert Center for the Performing Arts, shows Nov.30-Dec. 2 and Dec. 7-9. This isn’t any old performance of The Nutcracker. It’s a feast for the eyes thanks to the talented cast and a delight to the ears thanks to the live orchestra. Recommended for ages 5 and up. 2) Catch a holiday classic at the Virginia Theatre or watch a holiday TV show. Extra points awarded if it is one you watched as a child. 3) Go ice skating at the U of I ice skating rink, or head out to the David S. Palmer Arena in Danville for ice skating and a Danville Dashers hockey game. 4) Go on a Hot Chocolate or Cupcake Date. 5) Encourage your budding design gurus to make a Gingerbread House. 6) Learn to play a new board game during family game night. 7) Check out holiday books from a local library. Stick around for a holiday-themed story hour or party. 8) Take the little ones to a Polar Express Party. No party to be found? Take your little one to watch the trains around Champaign-Urbana instead! 9) Go caroling with you family in your neighborhood. If caroling isn’t your thing, attend a local Christmas music sign-a-long or holiday concert/show. 10) Walk in a Winter Wonderland: Go on a winter hike at The Museum of the Grand Prairie. 11) Take your little ones to Shop at the Crisis Nursery Holiday Shop. 12) Take the family to see a live Nativity scene. See our 2018 Guide to Area Live Nativity Scenes here. 13) Put the kiddos in the jammies and drive around to look at holiday lights. Up the fun anti with our Christmas Lights in Champaign-Urbana Scavenger Hunt! 14) Write a letter to Santa, or register for a free phone call from Santa. 15) Get in the Christmas spirit and take in the twinkling lights at the Festival of Trees. 16) Create a new tree tradition! Pick out a live one or cut your own tree at these places around Champaign-Urbana. 17) Donate a toy during our local toy drives, sign up for the Eastern Illinois Foodbank Family Food Repack, or adopt a family and shop for them. 18) Visit the IDEA store to source materials to make you own paper, make your own snow globe, make your own presents, make a paper wreath, and make some fun! 19) Watch a Christmas Parade. Bring some blankets and a Thermos of hot chocolate! 20) Take the family to see a special holiday movie at the Staerkel Planetarium in Champaign or the Virginia Theatre. 21) Head to Flesor’s Candy Kitchen in Tuscola for some Central Illinois candy or a soda fountain treat. 22) Paint a Pottery Gift with your little ones. Include a handprint or footprint. Make this an annual tradition to see how your kids grow! 23) Have a photo taken with Santa. Have your pet’s photo taken with Santa. 24) Visit the Orpheum Snow Globe. 25) See the reindeer at Hardy’s Reindeer Ranch. 26) Take your kids on a trolley or carriage ride. Check our calendar for more information. 27) Shop Local for a Christmas gift for your partner with the kiddos. 28) Dine with Santa. Breakfast or brunch – so many options! 29) Make your favorite Christmas cookies. The official Christmas cookie of chambanamoms.com: the chocolate crinkle. 30) Make snow angels on the Quad. 31) Go sledding at Homer Lake. 32) Make a snowman in the yard. Paint him or her orange and blue. 33) Have an epic snowball fight after building a snow fort. 34) Catch a fresh snowflake on your tongue. 35) Go for a snowy walk at Meadowbrook Park. Reminder: This is in no way to add to your holiday stress. It is merely a guide for fun, and should not be used to measure your holiday parenting skills. We know you’re a good Chambanamom (and dad)! Want more ideas? Subscribe to our Ho Ho Holidays Newsletter. Want more ideas for holiday (or everyday) fun? Check out our Events Guide. 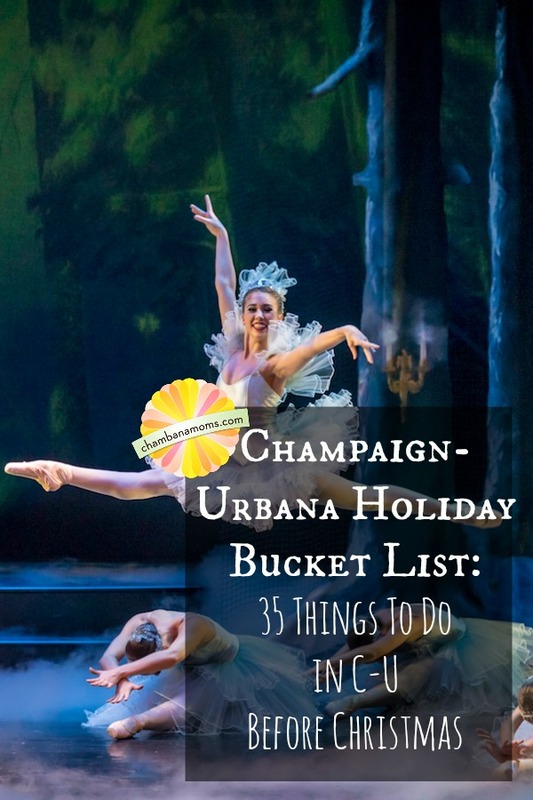 Did we leave something off our list that is a Champaign-Urbana Holiday Must Do for your family? Let us know in the comments!